Several different methods exist for generating electricity from the mixing of salt water and fresh water, which is also called salinity gradient power (SGP). One method uses concentration cells, in which two semi-cells separated by a porous diaphragm such as filter paper are filled with solutions of different ion concentrations. However, concentration cells are not as popular as other SGP techniques because they don't perform as well, typically generating only half the voltage of other methods. So a team of scientists from Italy was very surprised to find that, when substituting a zinc chloride solution for the sodium chloride solution that is typically used, concentration cells generate a voltage that is up to 150% higher than any other SGP technique, including reverse electrodialysis. Even though the device is only at the proof-of-principle stage, it already offers the lowest cost per watt (0.5 euro [$0.67 USD] / Watt) among all SGP devices. The researchers, M. Marino, L. Misuri, and D. Brogioli at the University of Milan Bicocca in Monza, Italy; and A. Carati at the University of Milan in Milano, Italy, have published their paper on the new concentration cells in a recent issue of Applied Physics Letters. The researchers explain that the performance improvement arises because the new cell greatly decreases the free energy loss that would otherwise occur. Usually, ion diffusion across the porous diaphragm results in a continuous loss of free energy. 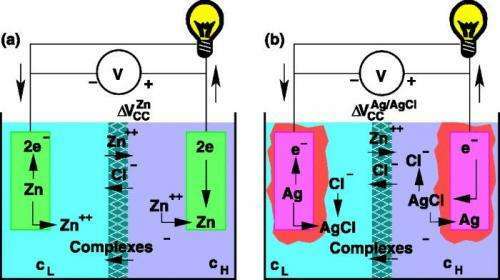 However, the new cell converts this free energy into electrical energy due to its use of zinc ions. 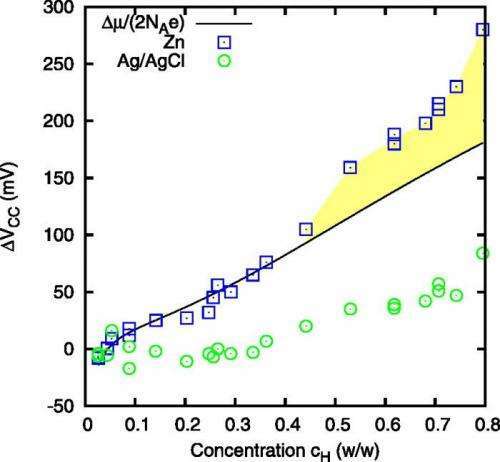 With the use of zinc ions instead of sodium ions, there is a larger difference in diffusion speed between ions, causing a giant liquid junction potential to develop across the diaphragm. This means that, when zinc ions diffuse across the diaphragm, they generate a beneficial current that drags chlorine ions along with them against the electrostatic force. In other words, the diffusion of zinc pumps additional chlorine ions "uphill," which converts this free energy into electrical energy. "The novelty is that the liquid junction is not simply a trivial transition between solutions, and it still hides surprises," Brogioli told Phys.org. "It actively converts the free mixing energy into electrostatic energy: this idea is nearly unbelievable. "We just separate the two solutions at different concentrations with a 'porous diaphragm'—nothing else than a filter paper sheet, and a (relatively) high voltage is produced. In the first experiment, I replaced an ion-exchange membrane, with a cost of 100 euros per square meter, with a piece of a paper tablecloth. Unexpectedly, the power output increased." As Brogioli explains, the technological applications are evident. "The zinc chloride solutions at different concentrations are not naturally available, but they can be artificially produced by means of solar distillation: it's a way to exploit the solar energy," he said. "The solar light is easily collected in the form of heat with an efficiency more than 90%, by means of the vacuum tubes with selective absorber coating; it's a mature and cheap technology. The heat can be used for distilling solutions of zinc chloride that are stored in reservoirs. When needed, the solutions flow through the SGP cell and get mixed, while an electrical current is generated. "Other heat sources, e.g., industrial waste heat, can also be exploited; other applications include the co-generation, i.e., the combined heat and power generation with saving of fuel." At its peak, the concentration cell's voltage currently reaches a value of more than 1.5 times that of other SGP techniques. The researchers hope that further improvements can be obtained by, for example, reducing the distance between the electrodes and using nanostructured electrodes. "First of all, we plan to build a big version of our cm-sized laboratory cell," Brogioli said. "The design is too easy to delay any more. Then we will build a stand-alone heat-to-current converter delivering a power of the order of 10 W.
"But the study will not be limited to zinc chloride. Many solutes form complexes between each other: we plan to study ternary systems, with two solutes in a solvent, which could even enhance the power production." What is the energy density? "Even though the device is only at the proof-of-principle stage, it already offers the lowest cost per watt (0.5 euro [$0.67 USD] / Watt) among all SGP devices." Is this cost correct or was it supposed to mean "the lowest cost per KILOwatt"? Impressive! Ms. Zyga, I wondered at this phrase, "concentration cells generate a voltage that is up to 150% higher than any other SGP technique" since my (very possibly incorrect) reading of the solid black line shows a voltage of around 175 mv, and the blue squares ending in around 275 mv. So I wondered if "1.5 times" had accidentally gotten misquoted as "150% higher" rather than "50% higher." I'm a layman and may well not be understanding correctly. I suspect that it's correct as written. I think they are quoting the price of the device itself -- not the estimated amortized cost of a watt HOURS (or kilowatt hours) over time. By analogy, one might quote a cost per watt to buy a 6000 watt gasoline generator (price / 6000) which is different from the cost of watthours delivered by the generator.